This baby Cthulhu plush toy is called " My First Cthulhu." Every goth newborn should start off with a nice cuddly spider toy. This one is called, "Timmy." It's by Skelanimals. I don't really like the Beanie Babies brand, but I have to admit this plush Halloween bat is pretty adorable. Tiny babies can't have toys in their cribs when they sleep. 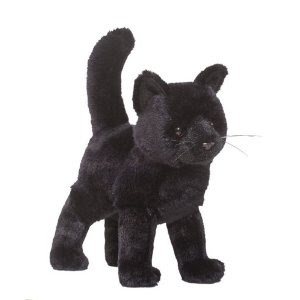 But this black kitty plush familiar can guard Baby from a perch on a nearby bookshelf or rocking chair!